ABASSIA (Villa Vicky) Stds, Apts. 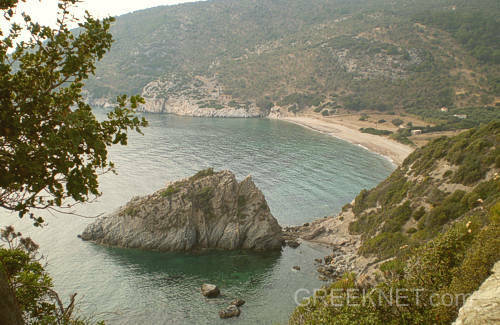 Lesvos island: The Hottest Walking and Bird-watching Destination! The Best Birding Areas in Lesvos! The unique unspoiled beauty of Lesvos (Lesbos) is an astonishing contrast to lush splendour of the rest of the cosmopolitan islands with its mysterious forests, dramatic coastline, tranquil sunsets and rugged mountains. A wealth of opportunities allows every visitor to pursue particular interests from sporting and adventure activities to cultural and leisure attractions. The mild Mediterranean climate, warm hospitality and friendliness of the people make your holidays to Lesvos island an unforgettable experience. This Island of astounding natural beauty is set like a jewel in the Aegean Sea. 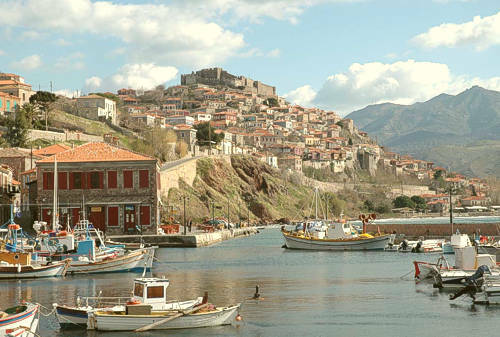 Just five miles from the coast of Asia Minor, Lesvos (or Lesbos) lies to the north of Chios and south of Lemnos. The breathtaking landscape rolls through regions of pine-covered mountains to areas of barren, yet dramatic volcanic stone. There are numerous sand and pebble beaches and many sheltered and isolated coves dotted along the spectacular indented coastline. The temperate climate, inland rivers and natural springs all contribute to maintain the surprisingly lush vegetation of the island. Lesvos is world renowned for it's many varied species of flora and fauna. 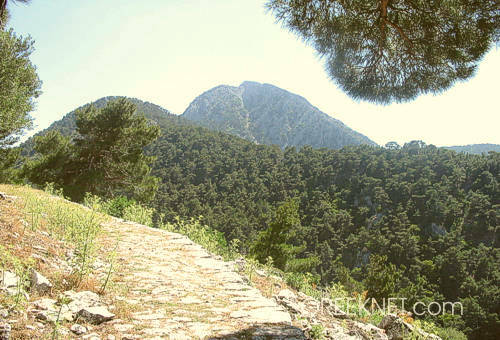 It is also host to a superb petrified forest located between Eressos and Sigri in the Southwest. This is a land steeped in tradition and rich in history and culture. The birthplace of musicians, poets, writers and artists who have been inspired through time and still in present day, by the natural charm and picturesque views allowing endless opportunity for exploration and discovery. Located on the Northern tip, Mytilene is the largest town on the island, the capital of Lesvos and host to the Airport and commercial Seaport. The town is located approx. 5km from the airport and if arriving by plane, you should consider taking one of the many taxis waiting outside. You will find car and bike hire agencies near the sea port (or try our LINK at left) and the main bus depot close by where you will find details of routes servicing the whole island. Public transport is a great way of seeing the island, but buses can be slow and the temperatures can soar above 40 degrees especially in high season. Be warned, and always travel with plenty of bottled water which is readily available from most shops and cafes. If you can, spend some time wondering the numerous back streets, where you will find many local cafes. 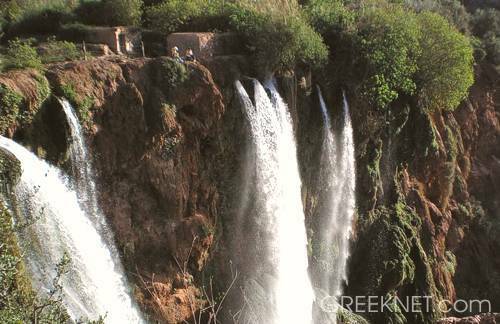 Try not to miss the market which is generally accepted as one of the best in Greece. The usual afternoon siesta is taken from 1 till 4pm and all but the larger shops will close. 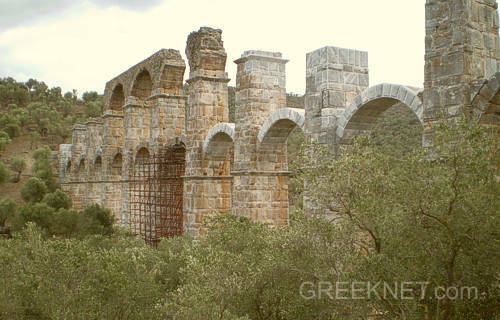 Further in the suburb of Varia one can visit the Theophilos Museum. And then, at the northest point of the island one will find the picturesque village of Mithymna (also known as Molivos), with its mediaeval castle and the traditional architecture. Molivos is also the islands best known resort. By some it has been called "the closed place to paradise, on earth". The association with Arts is appropriate enough, for it was here in Mithymna that the head of Orpheus is said to have been washed ashore after his dismemberment of the Thracian women. Another mythical citizen of Mithymna was the lyric poet and musician Arion. It has been said that he has been saved by the music-loving dolphin. Also near the center of the island another well known town is Agiassos. This town is famous for its pottery. Going further south again we reach the towns of Plomari, Polichnitos and Vatera which have the one of most superb beaches of the island, 10 Km long. Whether traveling by bus, taxi, hire car, bike or scooter, the scenery will unfold itself around you throughout your journey. The volcanic structure rises and falls like taught muscle undulating below a carpet of lush green to the North-east, and impressive volcanic rock formations to the West. Huge lagoons of water and strips of beach will appear shimmering below and then beside as you bend toward your chosen destination. Small churches, road-side shrines and even whole villages seem to playfully hide from view until you are almost upon them.